This week your PopCulteer turns to a bunch of short items, followed by a list of stuff to do. You just go enjoy the heck out of it, okay? 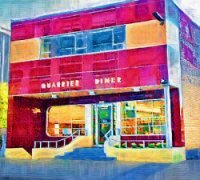 Owner Anna Pollitt announced this week that the historic Quarrier Diner will reopen for lunch in mid-September, this time with a menu that harkens back to the Diner’s roots, featuring Hamburgers, Hot Dogs and BBQ (and let’s hope, Grilled Cheese and Tomato Soup). This is great news. For one thing, it’s another option for lunch in Downtown Charleston. In addition, it’s a sign that this great building will be spared the wrecking ball. You may remember back when the Quarrier Diner closed in March that I wrote a post-mortem that included suggestions on how to bring the Diner back to its former glory. This move is a great start. Let’s hope that it’s successful, and that the Quarrier Diner can expand its hours of operation. He’s everybody’s Uncle and Grandpa! 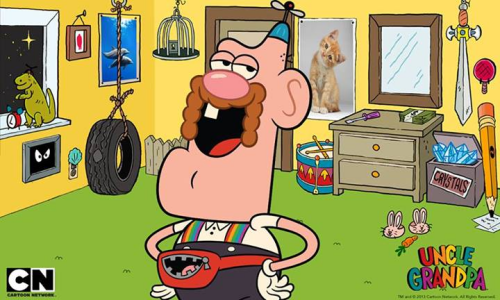 Uncle Grandpa is a new cartoon series that premieres Monday at 8 PM on Cartoon Network. How eager am I to see this? 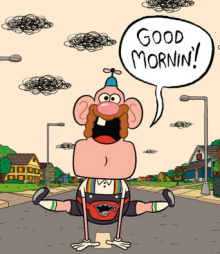 Well, I first mentioned Uncle Grandpa in this blog and ran the pilot cartoon EIGHTEEN MONTHS AGO. You should go sit in front of your TV right now and wait for it to come on. ShockaCon is less than a month away. Watch this video, and keep reading PopCult for more info as it gets closer. You ought to watch the new show. It just went up Monday and is already considered a classic by people who dish out such labels needlessly. Futurama, the cool Sci-fi cartoon by Matt Groening (with a really cool pizza place in some episodes) comes to an end next Wednesday. Comedy Central chose not to renew this show, which they revived after it was canceled by FOX. However, the sting of the end of Futurama is softened a bit by the news that South Park will return with new episodes the following Wednesday, for a ten-week run. Free Music tonight kicks off with RFC guests, Comparsa, opening the final Live at the Levee concert of the season at 6 PM. Himes and Allen perform at Taylor Books starting at 7:30 PM, while Mark Bates takes the stage at Bruno’s on Leon Sullivan Way at 9 PM. Music with a price (not specified if they didn’t provide it) includes Elysium and Among The Fallen ft local support from Beyond The Wayside sarting at 9 PM at The Blue Parrot, A tribute to Iron Maiden’s Live After Death at 10 PM at The Boulevard Tavern, Blues artists Holy Cow make their first appearance at Sam’s Uptown Café along with electric folk trio The BrotherSisters at 10 PM at Sam’s Uptown Cafe and Relative Obscurity returns to the Empty Glass with good friends Twist of Fate also at 10 PM. Free music Saturday includes The Return, a dance band playing at Timothy’s downstairs from the Quarrier Diner at 10 PM, and The Charleston Metro Band playing a patriotic concert to welcome the LST 325 to Haddad Riverfront Park at 5 PM. Music with a cover charge includes Johnny C and The Scurvy Dogs at The Monkey Barrel on Leon Sullivan Way at 10 PM and Dinosaur Burps with Time and Distance and Donnie Smith at The Blue Parrot at 10 PM ($5 cover). Free music happens at Tricky Fish at 6 PM with Spurgie and Friends, and there’s an open mic hosted by George Brackens at the Upstairs Lounge at Little India at 8:30PM, right across the street.